Studio Direct Cosmetic's Custom Bare Mineral Pressed Blushe line Features the Purest Micronized Triple Milled Bare Minerals which Protect and Correct Skin without irritation. Our Bare Mineral makeup is virtually weightless and allows skin to breathe while shielding against age aggressors. All Natural Bare Minerals are a chemical free sunblock which naturally shield the skin against ultraviolet light. Their powerful, light-reflective properties make flaws and imperfections looks less visible. All of our Bare Mineral products, both loose and pressed, are free of heavy fillers and pore clogging ingredients. Our formulations Do Not contain any potential irritants such as Fragrance, Oil, Talc or Dyes. Each formulation is also Hypoallergenic and Oil Free. Our Pressed formulations are fortified with nutrients and freeze dried vitamins which nourish your skin while providing extraordinary antioxidant protection. Due to its unparalleled purity, Bare Mineral makeup is the perfect choice after cosmetic surgery, chemical peels, laser treatments and waxing. Individuals that suffer from acne, rosacea, hyperpigmentation and other skin conditions will find that our Bare Mineral line protects and corrects whild revealing your skin's natural radiance. 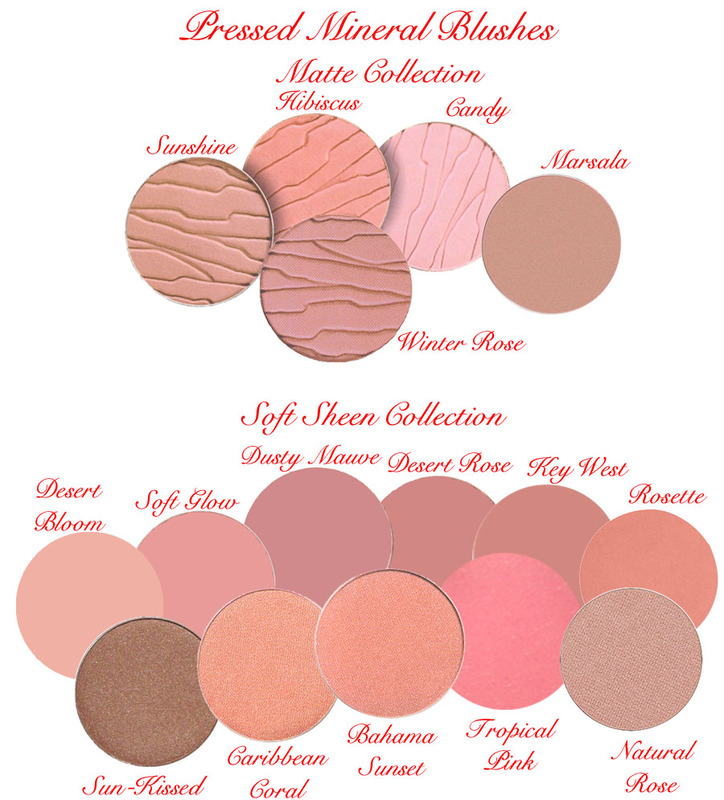 Our Pressed Bare Mineral Blushes are Hypoallergenic, Talc Free, Fragrance Free and Oil Free. These Earthly Micro Minerals that are Infused with Conditioning and Protective Vitamins. Our Matte Collection Features Pigments fused with the pearlescence of Minerals which imparts a modern "matte glow." Our Revolutionary, skin-smoothing texture floats over skin to impart a soft, imperceptible finish while deflecting light away from imperfections. Our Soft Sheen Collection Features a Satin Finish Formulation that floats on your skin, creating a Healthy Glow. Both Collections are Luxurious and Long Wearing. They brush on easily without streaking or the need for blending. Our Flat Top Brushes are recommended for use with our Pressed Bare Mineral Blushes shown above as the Flat Top Brushes excel at picking up and applying the Pressed Bare Minerals. Our Chisel Deluxe Flat Top Brush is perfect for applying all types of pressed products.